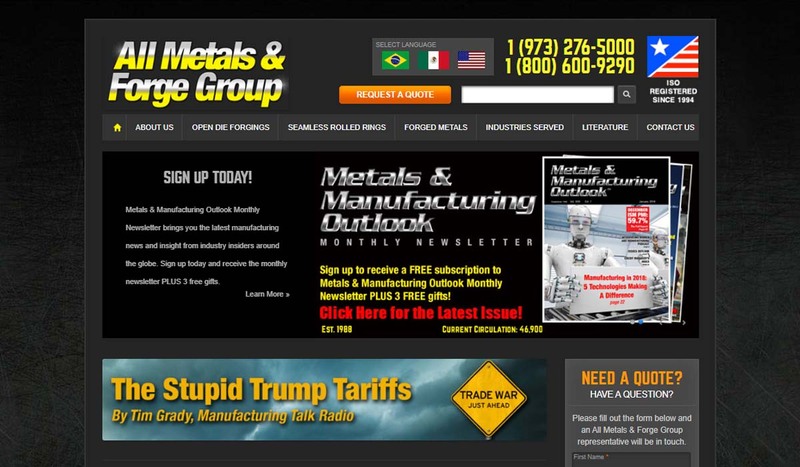 A reliable source for Forgings information and a resource for accessing leading Forgings and suppliers. 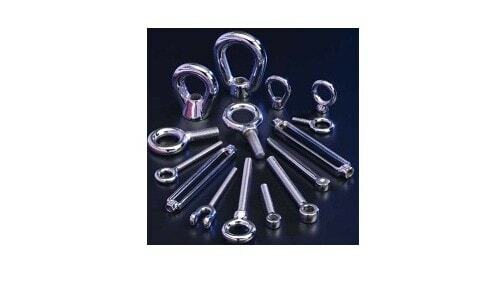 Metal material parts produced through the forging process are known as forgings. During forging operations, a compressing force pressures the metal, causing plastic deformation and an alteration of the metal grain flow, whereby the metal assumes the shape of the forging die. Note that, in this process, while forged metal material may be preheated, forged metal is never melted or poured. The forging process is popular for its ability to create extremely strong and durable metal products upon which users can rely. Forging serves a wide variety of applications that require reliable support of human wellbeing and safety. 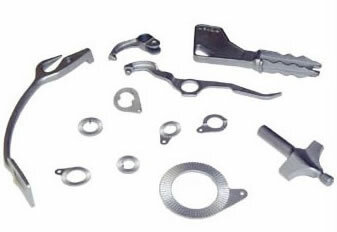 Manufacturers Metal material parts produced through the forging process are known as forgings. During forging operations, a compressing force pressures the metal, causing plastic deformation and an alteration of the metal grain flow, whereby the metal assumes the shape of the forging die. Note that, in this process, while forged metal material may be preheated, forged metal is never melted or poured. 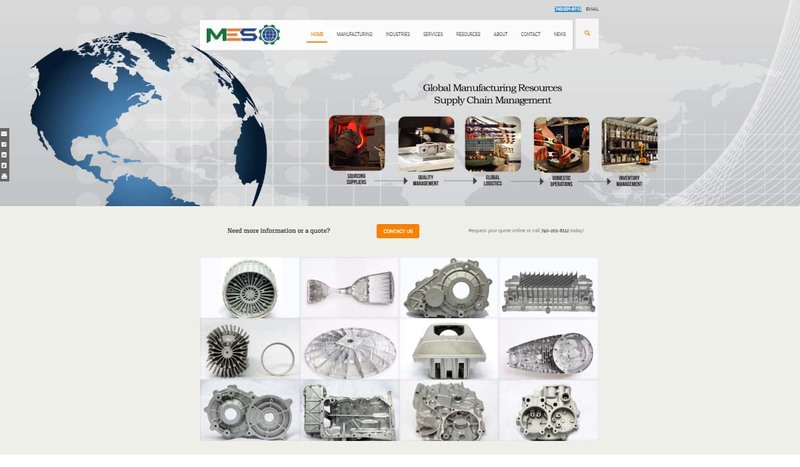 MES, Inc. has an extensive amount of forging experiences in a number of different industries. Here at MES, Inc. we put the customer first and our mission is to exceed your expectations. All Metals & Forge Group is your ISO9001:2008 and AS/EN9100:2009 registered forging facility. All Metals provides a wide range of materials, products and services, including discs, shafts, sleeves, cylinders, plates, blocks, and more. Although we have over 100 years of experience, we are committed to continually expanding our offerings in all industries. We are not content to remain as we are, but we continually work to improve our products and processes each and every day. 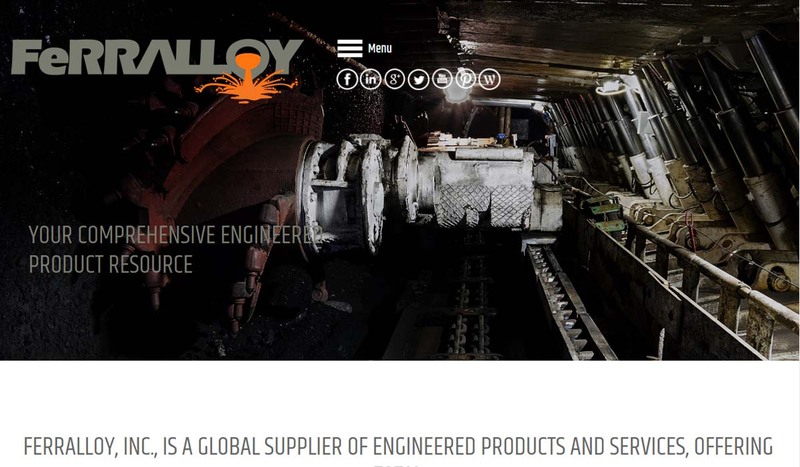 For over 30 years, we have provided metal forged products for a wide variety of industries, including the aerospace, military, food service, medical, and automotive industries. Our customers know they can trust our forgings for quality and affordability. 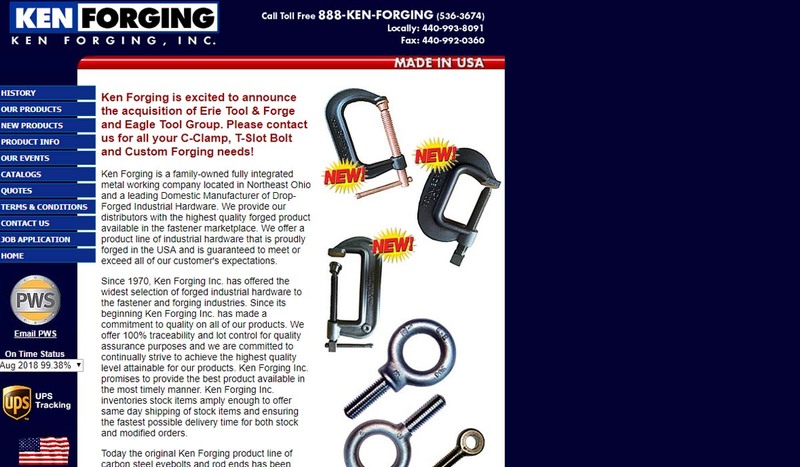 Here at Ken Forging we are a family-owned business who offers our customers high quality forgings. We require no minimum orders and our forgings come in a variety of materials including: stainless steel, carbon steel and more. 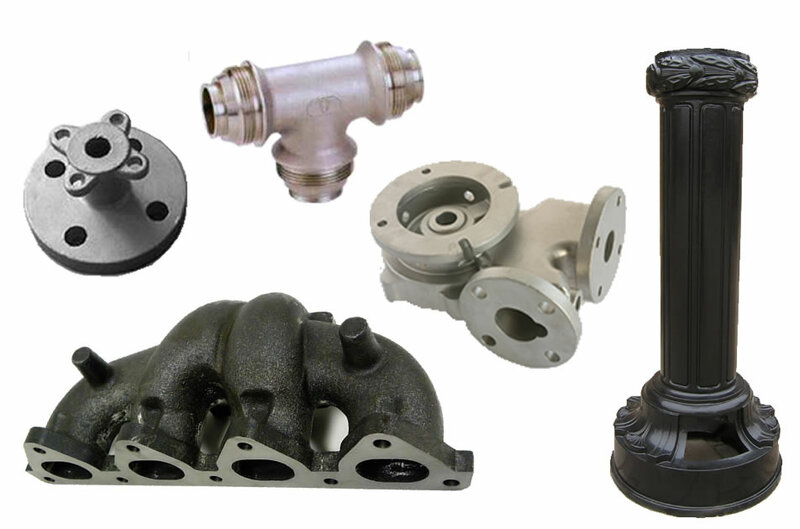 Manufacturers use forging to create metal products of all shapes, sizes and strengths. Some common examples include jewelry, kitchenware, weapons and hardware. Forgings also serve as components of ships, tractors, engines, tools, airplanes, automobiles, missiles and material handling equipment. They are often featured in these systems and machines as: augers, gears, engine blocks, train tracks, ship valves, brass forged bolts, anchors and more. People have been forging metal for about as long as they’ve known about metal. Among the earliest examples of forgings, we have today are those forged by the Sumerians around 4500 BC. The Sumerians were the first known civilization to spring up in Mesopotamia. They lived along the Euphrates River Valley and Tigris River Valley areas, in what is now southern Iraq. They forged items using the only metals known to them, bronze and copper, by heating them over fire then beating them with rocks. In this way, they were able to shape tools. The first furnace, called the bloomery furnace, was constructed during the Iron Age, around 750 BC. The bloomery furnace was made from clay and stone and smiths used it with a bellows in order to make hotter fires. This invention allowed smiths to forge iron. These furnaces were used by a few different societies, including the Nok people who lived in what is now northern Nigeria (500 BC) and in Nubia, Axum and Kush between 1000 BC and 500 BC. The Chinese began forging and casting iron tools during the 5th and 4th centuries AD. They were also the first people to use blast furnaces and finery forges. Their blast furnace design, invented 1st century AD, was widely used until the 20th century AD. Many other ancient civilizations used blast furnaces including the Celts, Carthaginians, Greeks, and Romans. The waterwheel, which was invented in Egypt during the 4th century BC or earlier, was adapted by the Greco-Roman world between the 3rd and 1st centuries BC. The waterwheel offered them additional power, which they were able to use for forging. Meanwhile, in 1st century AD China, smiths used water wheels to power the piston bellows they used to forge iron ore.
As early as 900 AD, the Romans were forging metal horseshoes, hand tools, knives and jewelry. During the Dark Ages that followed, the forging of knives and other weapons was incredibly important. Between the 10th and 12th centuries AD, people were able to urbanize their cities using the water wheel, which let them more easily and effectively forge large iron items. Nevertheless, the forging process did not really evolve until the Industrial Revolution. During the 1800s, with the help of newer technologies like steam engine power, engineers pushed the forging process to new heights. They found that they could build forges anywhere they wanted, not just by the water. Another big change came in 1856, after Sir Henry Bessemer patented the Bessemer Process for mass producing steel. After this, came the closed die forging, which companies like Colt used to mass produce gun parts. In the 1930s, engineers finally invented the modern forging press, or forge press. Today, manufacturers perform industrial forging with these presses as well as with hammers. These hammers, unlike the basic blacksmith’s hammer, are powered by mechanisms like: hydraulics, pneumatics, electricity or steam. The forging process is compatible with a number of ferrous and non-ferrous metals, such as copper, titanium, aluminum, stainless steel, carbon steel, brass and various other alloys, like nickel alloys. All forged materials have different characteristics, and thus offer different benefits to manufacturers and end-users. Copper forgings are non-sparking, non-magnetic, oxidation resistant, soft and stable at high temperatures. In addition, they conduct electricity well, but without the risk of magnetic interference or sparking. Titanium material has a larger price tag than most, but it compensates with excellent corrosion resistance, high temperature resistance and a superior strength-to-weight ratio. Aluminum is lightweight but strong and easy to forge. 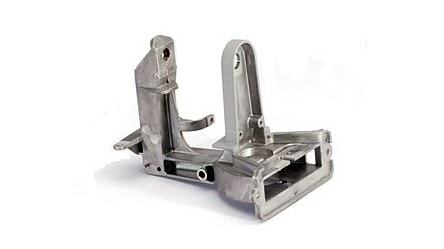 Aluminum forgings are especially important to aerospace and aviation engineers. Stainless steel is an alloy steel that offers all the positive qualities of regular steel, like durability, ductility and high strength, as well as the added property of corrosion resistance. Carbon steel, an iron alloy, responds well to heat treatment and provides good mechanical properties at an economical price. Brass is an alloy composed primarily of copper and zinc. This material is aesthetically appealing, non-sparking and also has a low level of friction. Brass forging is popular for making parts like: casings, gears, locks, hardware, fittings and bearings. Nickel alloy boasts oxidation resistance and exceptional stability, even when exposed to high temperatures. Nickel alloy forge operations are usually performed at temperatures above nickel’s recrystallization temperature. Forgings are made through two main forging methods: closed die forging, also known as impression die forging, and open die forging. Closed die forging, the most common die forging method, involves the use of a hammer and anvil, or hammer alone, and a die or set of dies. During this process, the hammer and anvil press preformed metal blanks, called ingots, into the set of dies, which are shaped as three-dimensional negatives of the part-to-be. Because the hammer and anvil completely cover the work piece, the metal spills into all areas of the die. In addition to these steps, closed die forging frequently requires a work piece travel through a series of impression cavities that will take it from a rough shape to the final product. The limits of closed die forging are nearly nonexistent; it can produce a countless number of 3D shapes and complex parts with tight tolerances. Open die forging involves hammering or pressing metal workpieces into their desired shapes with the help of non-closed, simply shaped dies. Dies may be convex, concave or flat. Because it usually takes multiple strikes or presses to get a workpiece to its intended shape, an operator must repeatedly reorient and reposition it, so that the die will fall onto its sections successively. Open die forging produces forms and shapes that are simpler, like round, hexagonal and rectangular beams, bars and profiles. For this reason, and because open die tooling is less expensive, it fits best with lower volume production and the creation of unique, custom items. Depending on the exact process, forging may involve the operation of a variety of different pieces of machinery. The most common of these include: ovens, drop hammers (hammers and anvils) and forging presses. In forging, ovens are heated by gas or coal. Today, gas ovens are much more common than coal ovens. This is because, while coal can create higher temperature fires, it requires more maintenance and it is not environmentally friendly. Hydraulic drop hammers are vertical hammers that, at rest, suspend over a stationary anvil or die with a work piece placed on top of it. They drop the hammer onto the material work piece to deform it. Forging presses are machines that use a press instead of a hammer to shape the metal. Forging presses may use mechanical power or hydraulic power to work. Other forging processes include: warm forging, cold forging, hot forging, hand forging, roll forging, roll ring forging, drop forging and press forging. Warm forging is any forging process during which the metal is heated to 30% above the recrystallization temperature. Warm forging helps manufacturers create products with higher tolerances and less surface scaling. However, it does require higher forming forces and does not allow for as much formability as hot forging. Cold forging occurs when manufacturers perform forging below a metal’s recrystallization temperature. Often, this is simply room temperature. The cold forge process is best for operation on softer metals like: silver, gold, bronze, copper, brass and platinum. Manufacturers like cold forging because with it they can achieve extremely high tolerances and high tensile strength. Also, cold forging creates no surface scaling. Hot forging operation takes place at a temperature above metal recrystallization temperature. High temperatures make metal much more malleable, so that it is easier to deform. The hot forge process also creates products with more consistent and evenly spread high tensile strength. Roll forging is a forging process that relies on two grooved cylinders to do the work. During this process, manufacturers pass a heated metal bar in between the grooved cylinders until the bar attains the right dimensions. Usually, manufacturers use roll forging for the production of hardware like leaf springs and axles. Because roll forging does not create flash and it creates parts with high quality grain structure right off the bat, it creates much less waste than many other forging processes. Roll ring forging is a roll forging operation designed to forge rings. Forged rings are usually produced via an open die forging operation, not a closed die forging operation. Drop forging is a hammer forge process performed by raising and then dropping a hammer onto a workpiece that is placed on a die. It takes only milliseconds for the hammer drop forge to reach the die. Manufacturers release the hammer until the work piece takes on the form of the die. Drop forming can be performed with an open die or a closed die. Closed-die drop forging involves the use of a die that fully encloses the workpiece. Press forging involves forming a work piece by slowly and steadily applying pressure either below or above its recrystallization temperature. In this process, the press reaches the workpiece in a matter of seconds. The press forged process allows manufacturers to deform the metal in its entirety. It also allows manufacturers to precision control the forged workpiece’s internal strain. Composite forging operations are any forging operations that feature the qualities of more than one forging operation. One such example is cold press forging, a composite of cold forging and press forging. The forging process offers many benefits, including: design flexibility, minimal secondary operations and cost effectiveness., especially when compared to casting and welding. Also, it consistently produces extra strong metal parts and products with very few defects. Before agreeing to work with a forging company, you need to make sure that they can meet your needs. For example, many companies offer valuable secondary services, such as: custom die machining, metal stamping, post-forging product testing (ultrasonic testing, radiography, etc. ), delivery services and post-delivery support. To help you find the right manufacturer for you, we’ve put together a list of metal forging companies we trust. 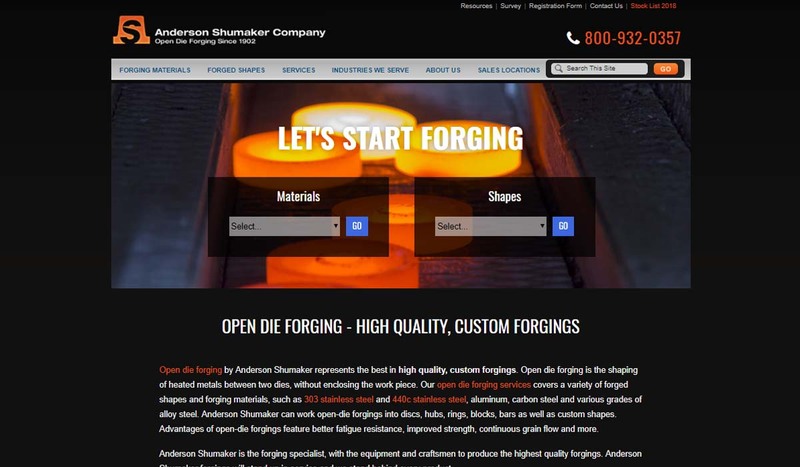 Any one of these metal forge companies can deliver you high quality work. Before you begin browsing their offerings, take some time to put together a list of your specifications. Don’t forget to include: your budget, your standard requirements, your delivery preferences and your timeline.  Then, peruse the company profiles we’ve provided. Pick out three or four you believe hold the most promise, then reach out to discuss your specifications. After you’ve spoken with each of them, compare and contrast your conversations and their answers, and choose the right one for you. Good luck!